Tucked away in the Blue Ridge Mountains, Blowing Rock, North Carolina is a bustling mountain town that is known for its outdoor opportunities, quaint dining and shopping, and beautiful scenery. It’s also one of the most dog-friendly towns we’ve had the pleasure of visiting. 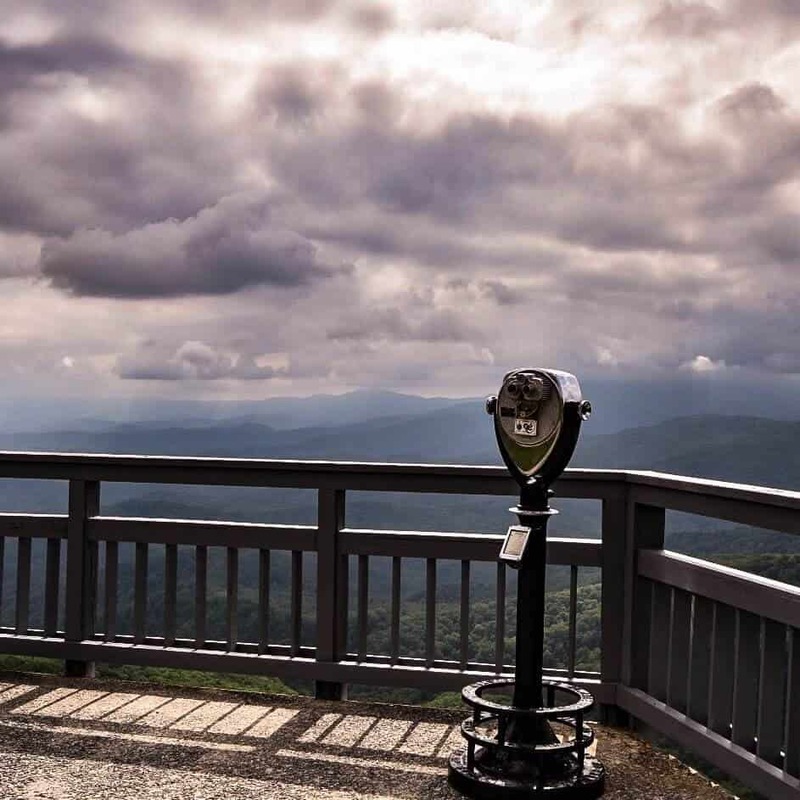 Blowing Rock, NC is affectionately called the “Crown of the Blue Ridge,” and is a must-stop destination if you’re traveling on the world-famous Blue Ridge Parkway. Ready to take a little tour of this storybook village in the mountains? 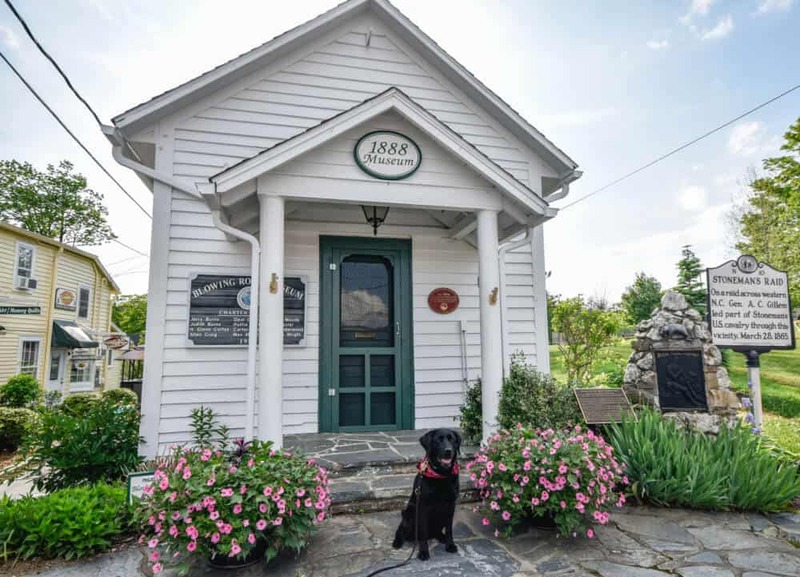 Here’s an overview of some of our favorite things to do in Blowing Rock, NC, as well as some tips for visiting with dogs. 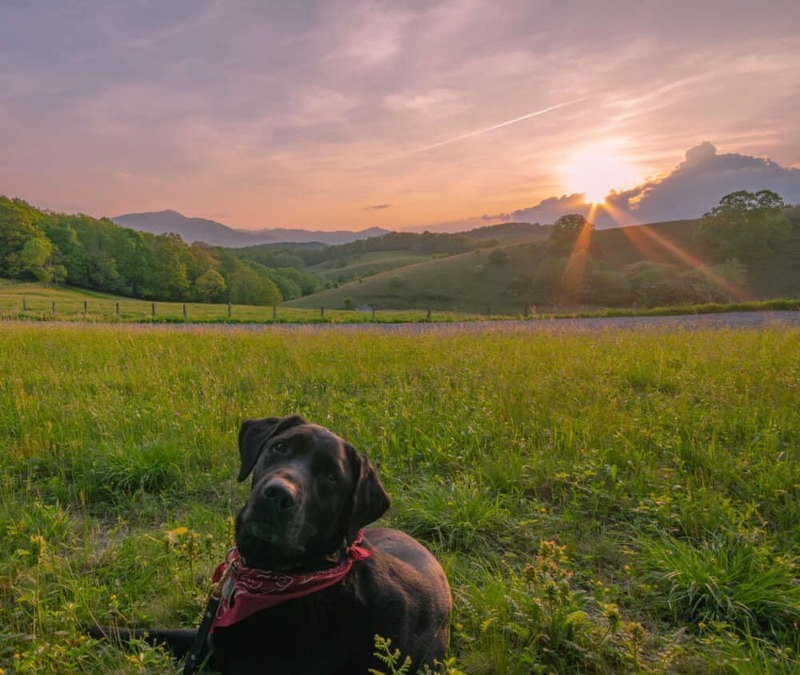 Located right on the Blue Ridge Parkway at milepost 294, Moses H. Cone is an awesome destination for history buffs, hikers, picnickers, dog walkers, and sunset lovers. The park encompasses 3,500 acres of what was once the grand estate of Moses and Bertha Lindau Cone, who made their fortune in the denim industry. The house, known as Flat Top Manor, was built in the 1890s. The estate was donated to the Blue Ridge Parkway in 1950. 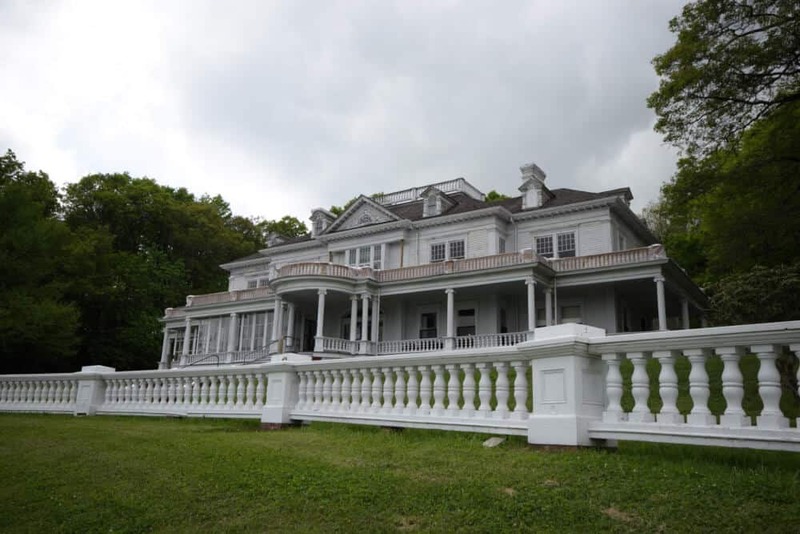 While much of Flat Top Manor is being restored, visitors can take ranger-led tours of second floor, and explore the local craft shop on the first floor. Dogs, however, must stick to exploring the grounds. The beautiful estate grounds include 26 miles of carriage trails, two small lakes, and an observation tower at the top of Flat Top Mountain. Dogs must be kept on a leash on the grounds of the estate, and you will likely encounter plenty of hikers, photographers, joggers, and horseback riders. If you are short on time, I recommend a stroll around Bass Lake or on the Figure Eight Trail, which starts near Flat Top Manor. If you have a bit more time, definitely hike the 2.8 miles (one way) to the observation tower. Sunset from the carriage road just past the Blue Ridge Parkway underpass is fabulous. It’s also a good spot for an evening picnic. You can read more about visiting Moses H. Cone Memorial Park on the National Park Service website. 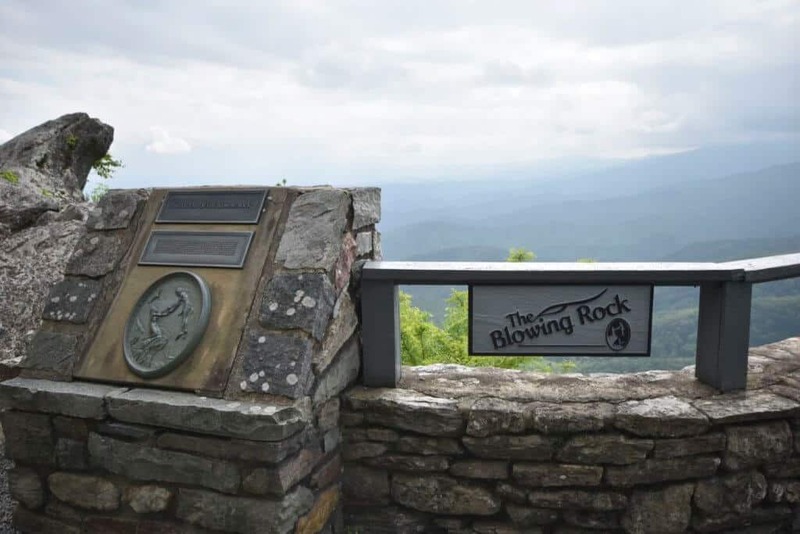 The Blowing Rock is touted as North Carolina’s First Tourist Attraction and has been attracting visitors since 1933. 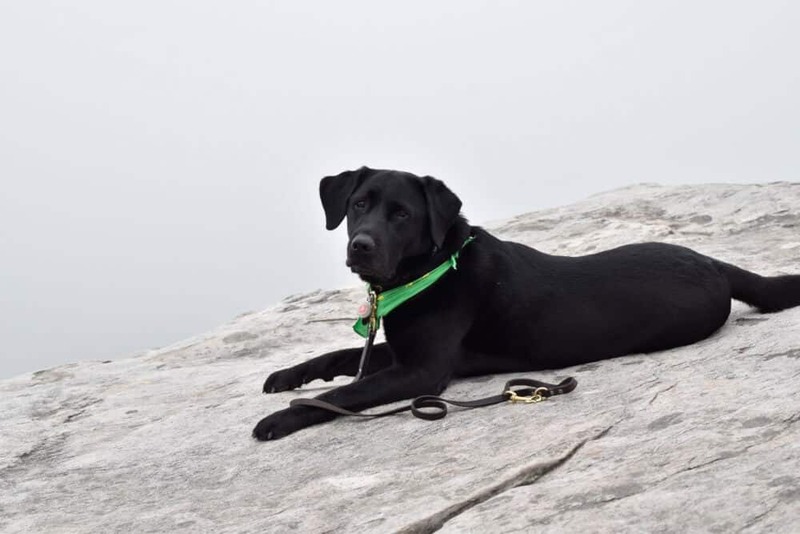 While it’s definitely a commercial venture, charging $7 per person for a look at the rock and the view, it is completely dog-friendly, and a beautiful spot for a picnic. There are flat, handicap-accessible walking paths and overlooks, lovely gardens, and a gift shop. This is the Blowing Rock! 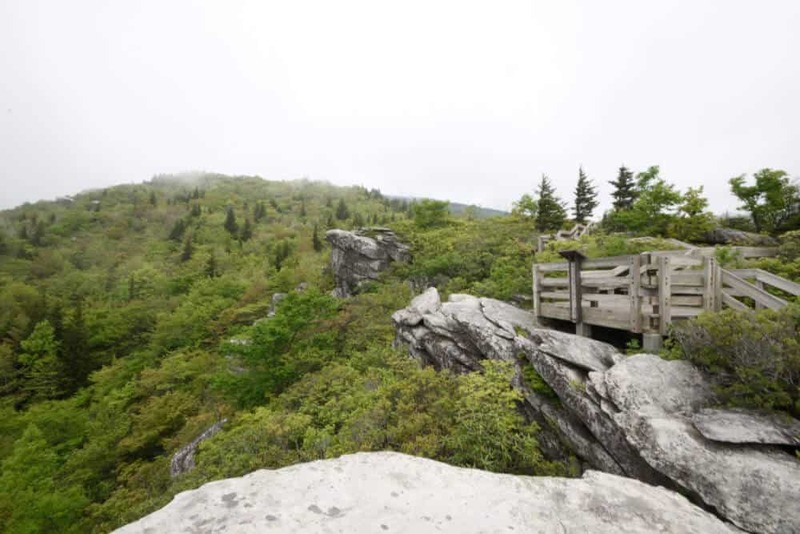 The attraction and the town’s namesake, the Blowing Rock, is a slab of Gneiss that juts out above the surrounding cliffs, 4,000 feet above sea level. Supposedly, the walls of the gorge below form a wind tunnel. The winds blow through with such force that it returns light objects that are thrown into the void from the rock. I can’t vouch for that, as there was absolutely no wind the day I visited. For more information on visiting the Blowing Rock in Blowing Rock, check out their website. The best view on the Rough Ridge Trail, at least on a cloudy day. The Rough Ridge Trail is a beautiful little hike (1.5 miles round-trip) with awesome views of the surrounding mountains, as well as the Linn Cove Viaduct. Starting at the Rough Ridge Overlook on the Blue Ridge Parkway, milepost 302.8, the Rough Ridge Trail is actually a small section of the 13-mile Tanawha Trail. To make our hike a little longer, we started at the Boulder Fields Overlook (milepost 302.4), and hiked up to the Tanawha Trail and then on to Rough Ridge Summit, at 4,773 feet in elevation. The hike is moderately steep and travels through rhododendrons and hardwoods, across several wooden bridges and small waterfalls, before finally reaching a wooden boardwalk that was created to protect the delicate vegetation on the summit. The views from the top are spectacular if you go on a clear day, but when we hiked to the summit, the mountains were shrouded in clouds. Check out these photos from Romantic Asheville to see the views we were hoping for. Blowing Rock is a thoroughly walkable town, with cute boutiques and restaurants, plus several lovely parks and an itty-bitty museum. Most importantly, they’ve got two ice-cream shops and a fabulous coffee shop, and just about every store has a bowl of water out for thirsty pooches. Memorial Park, which is located right on Main Street, is not dog-friendly, but if you walk down Laurel Lane from Main Street, you will come to Broyhill Park, which allows dogs. There is a small pond, gardens, and benches for relaxing. 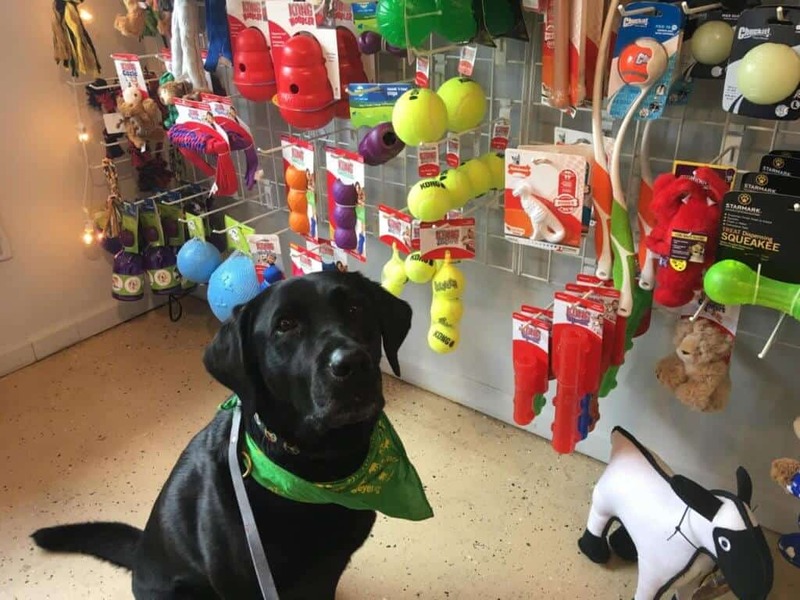 While many of the stores in downtown Blowing Rock allow dogs, your dog’s favorite place will definitely be Stella Blue’s Pawtique. Flynn and I popped in to get him a little treat, and we were amazed by all the dried animal parts for sale. I bought him a duck neck, which he devoured in two seconds. Stella Blue’s loves meeting the dogs that come to town, and they have a great selection of treats, toys, beds, and collars. It’s definitely a must visit if you’re passing through with your pooch! While most restaurants in Blowing Rock won’t allow your dog to come inside, many have fabulous outdoor decks, patios, or dining areas where you can bring your dog. We dined at many local restaurants during our visit. Here’s an overview of all the restaurants in Blowing Rock that allow pets. I’ve put a * next to the ones that we dined at during our stay. 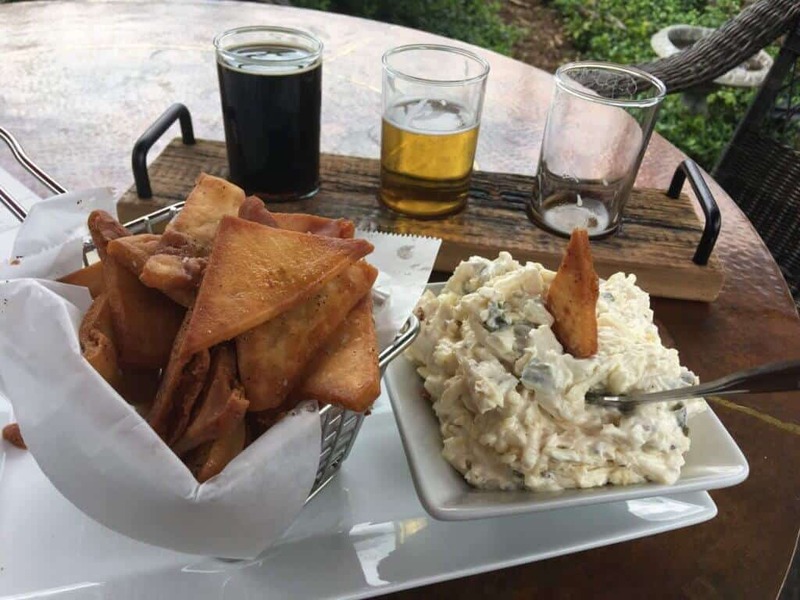 Located on Sunset Drive, Blowing Rock Ale House is the perfect place to unwind after a day of shopping or hiking. There are several outdoor picnic tables to choose from, as well as a huge variety of beers brewed behind the restaurant at the Blowing Rock Brewing Company. Fare is pretty standard pub food with a bit of local flare. My server recommended the roasted poblano and white cheddar appetizer, which is a dip served with flatbread chips. It was really yummy, but perhaps a to gooey and cheesy for such a hot day. I ordered a flight of three beers for $7, and really loved the High Country Ale, a golden ale with floral notes — the perfect summer beer in my opinion. Flynn enjoyed his bowl of ice water and lots of petting and compliments from the waitstaff and other diners. This little cafe makes awesome coffee and crepes, perfect for a relaxing morning on their expansive porch. It’s a great place for people watching, as there are lots of folks coming and going. As with just about every place we went in Blowing Rock, Flynn was welcomed and doted on. We only visited for breakfast, but the lunch menu looked pretty enticing as well. Change depending on the season. Check the Blue Ridge Bites and Brews website for updated info. We heard good things about the Foggy Rock Eatery and Pub, but we didn’t get a chance to check it out ourselves. They have two tables on a small patio where dogs are welcome. They serve local beers, wine, and spirits, and small menu with some eclectic offerings. I had never heard of this national pizza chain, but the dining options sound so yummy — holy shitake pizzas, tempeh hoagies, and enlightened spinach salads. Can’t wait to give this one a try. Dogs are welcome on their outdoor patio. Classic Italian American fare featuring a range of pasta dishes, seafood, steaks, poultry, and pizza, Papa Joe’s allows dogs at five outdoor tables on their patio. Sweet potato fries and bleu cheese! Another awesome downtown pub! Six Pence Pub has a spacious patio that welcomes dogs. Flynn was offered a huge bowl of ice water as soon as we were seated. We shared the patio with two other dogs without an issue. I started with a Wicked Weed Cucumber Golden Ale, a Saison that came with a cucumber slice and was so refreshing! 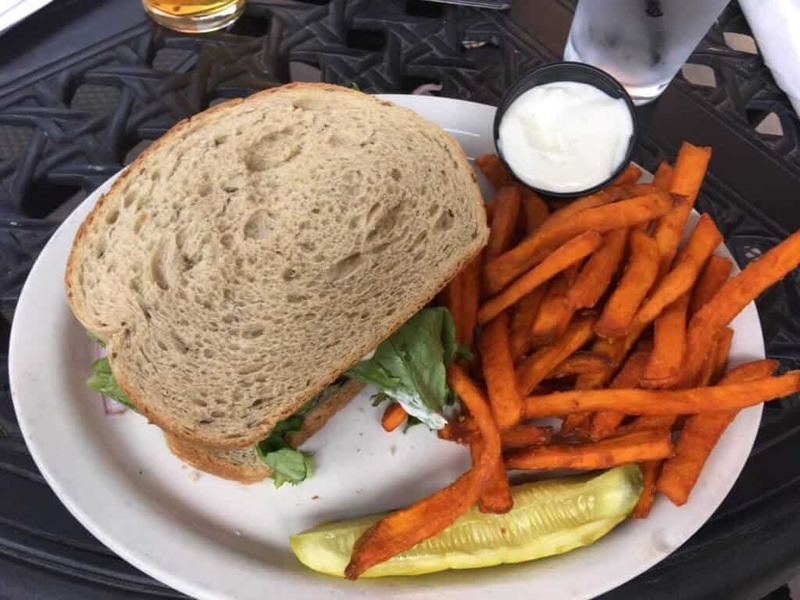 For dinner, I ordered a grilled portabella sandwich on rye with a side of sweet potato fries. The fries came with bleu cheese, which made my day. Most of the menu consisted of classic British pub fare, cooked to perfection. Featuring a small menu of regional dishes, the Speckled Trout welcomes dogs to their outdoor patio. Menu items include a pickled watermelon salad, fried trout belly, and bison ribeye. The local bottle shop features a great (and unusual) selection of beers and wines. The Town Tavern is a sports bar on Main Street with the largest outdoor dining area around. Featuring live music on the weekends, water bowls and treats for dogs, and a large tavern menu and beer selection, this is definitely a hoppin’ spot for locals and tourists alike. 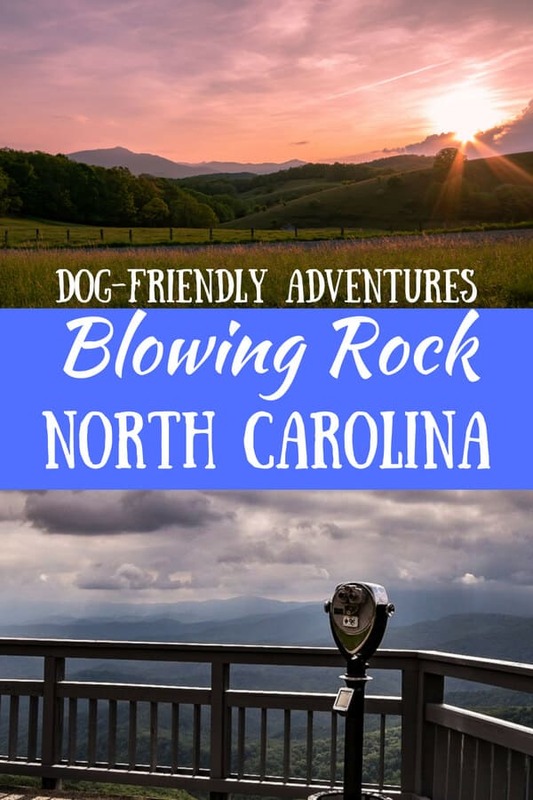 Because Blowing Rock is so dog-friendly, and such a destination for travelers, I assumed that there would be lots of places to stay in the area with dogs. I was right, and in researching our options on the Bring Fido website, I found 64 places where pets are allowed. Pretty good for a town of just 1,300 people. Upon further inspection though, I realized that most of the properties listed were for cottages, houses, and vacation rentals. Since I really only needed a single hotel room, my choices were narrowed down significantly. 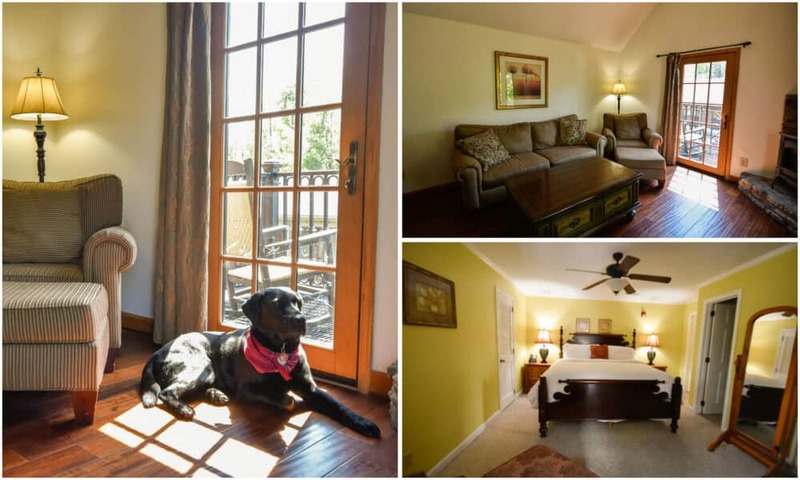 If you are looking for a dog-friendly vacation rental, definitely check out Bring Fido. For hotel options, check out Visit Blowing Rock’s pet-friendly lodging page. 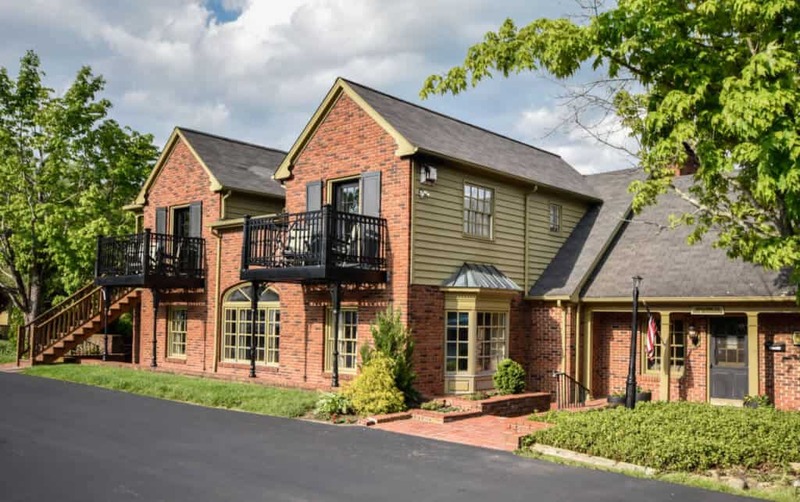 After a bit of research, we settled on Hillwinds Inn, which is within walking distance of shopping, parks, and dining. The staff at Hillwinds Inn truly love dogs, and you definitely get the feeling that dogs are welcome, not just tolerated. There is a $35 pet fee per night, which covers the extra cleaning required for the dog-friendly rooms. 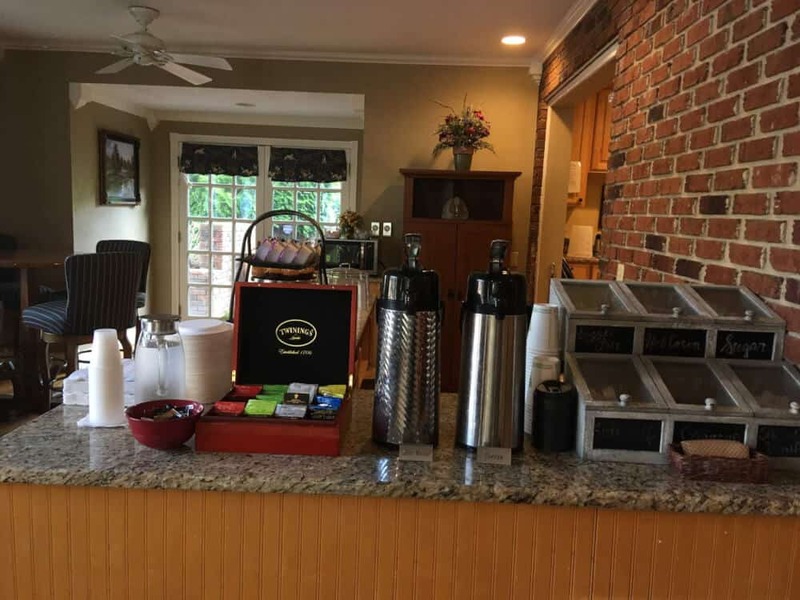 We were excited to book the Tarheel Suite, which included a separate bedroom with a queen bed, a sitting area with a gas fireplace, a balcony, and a small kitchenette. The rooms are climate-controlled and so comfortable that it was sometimes hard to head out each morning to explore. My only complaint would be the lack of a workspace or table in the Tarheel Suite. Not a huge deal, but I did work/eat on the sofa, which wasn’t ideal. I had the opportunity to peek inside the regular guest rooms during my visit, and they are just as lovely, with comfy beds, microwaves, mini-fridges, and warm and inviting decor. 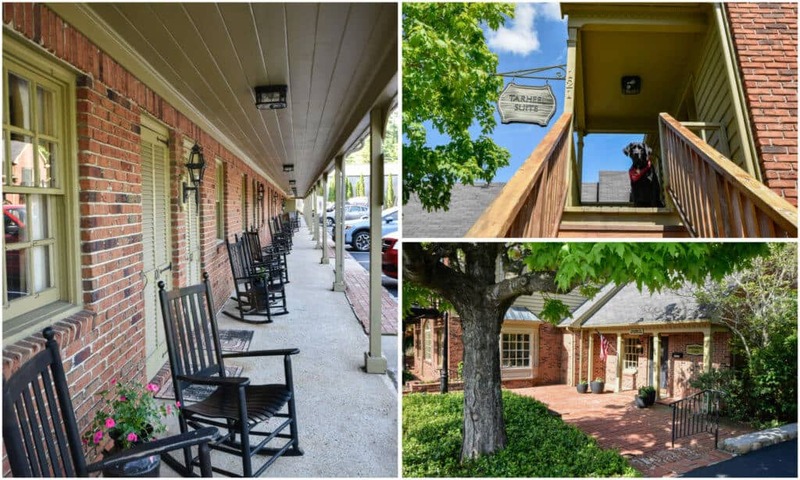 Each room has cute rocking chairs out front to relax in, which is such a welcoming way to meet other travelers that are passing through the area. I would not hesitate to recommend Hillwinds Inn to anyone visiting Blowing Rock. It is such a cute and welcoming place, and you can’t beat the downtown location. You can read more about Hillwinds Inn of Blowing Rock on their website. Here are the resources I used to plan my trip on the Blue Ridge Parkway and to Blowing Rock. Visit Blowing Rock – This is one of the best tourism websites I’ve used. I love that they provide specific itineraries based on your interests, plus they have lots of dog-specific advice. Definitely check out the Visit Blowing Rock website as you start to plan your trip. Blue Ridge Parkway Association- The Blue Ridge Parkway is maintained by the National Park Service, but the BRPA is a member organization that works to attract visitors and promote businesses along the Blue Ridge Parkway. Their website is a great resource for planning, and they even have a trip-planning app. 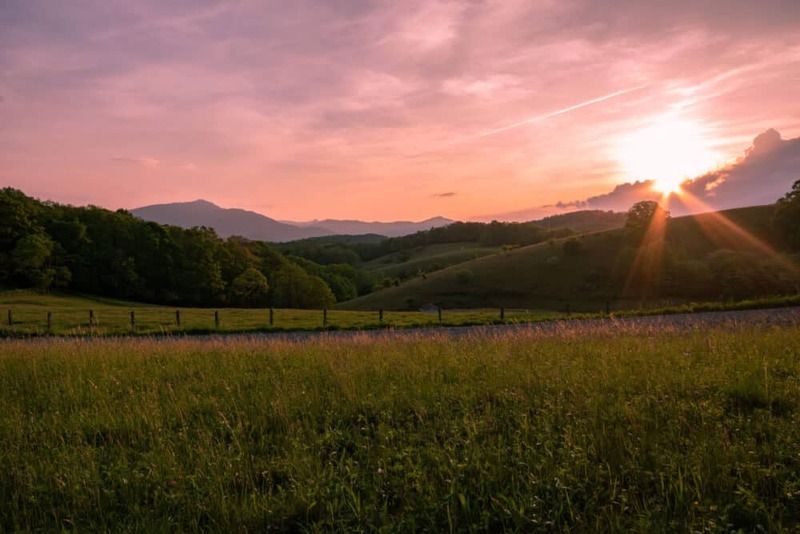 National Park Service – The official site for the Blue Ridge Parkway, the NPS website will keep you up-to-date on alerts and road closures, and provide you with an overview of trails, campgrounds, and attractions along the 469-mile roadway. I bought the Blue Ridge Parkway road map before my trip, as well as the hiking guide, and I found both to be incredibly useful on my journey. Please note: This post is sponsored by Visit Blowing Rock, and I received complimentary lodging during my stay. All opinions about my visit are entirely my own. 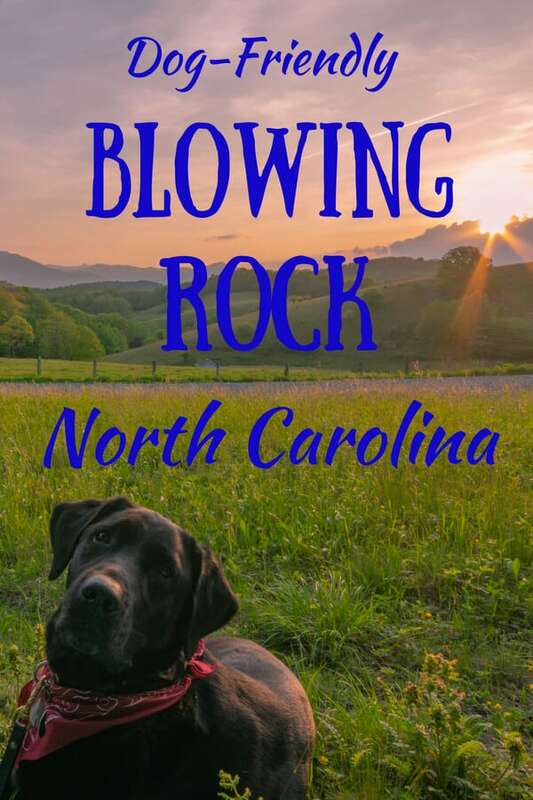 Blowing Rock comes across as a paradise for Man and his best friend. What a lovely place, no wonder Flynn seems to be enjoying to the hilt. I was riveted by the pictures and description of Moses and Bertha Lindau Cone estate. What a magnificent and sprawling estate this is. Downtown too looks so colourful, vibrant and charming with some amazing restaurants and great food to match. First of all, I am envious of Flynn as your lovely dog is enjoying the beautiful nature. Those sunset from Cone Memorial Park is adorable and the pic of Blowing Rock. You have taken stunning photos of Flynn with the landscape. Blowing Rock looks like a cute place to visit. We don’t have a dog, but we do have kiddos, and it looks absolutely kid-friendly as well. I think we would enjoy the little museum, and the restaurants. Those are a ton of dog-friendly things to do! My niece (who’s an animal lover) would love this post. That has to be the smallest and most adorable museum I have ever seen! As a dog person myself, I’m always on the lookout for outdoorsy places to take my pup. Great to learn about Blowing Rock! Btw the Rough Ridge Trail sounds amazing! Love reading this post but I am pretty sure Flynn is the most calm traveler I have seen on the internet for a long time. Blowing Rock looks really beautiful and I hope I can be in the area one day. Blowing Rock looks beautiful, adding it to my travel list ? your doggie is adorable! Blowing Rock looks gorgeous. I would love to visit it sometime. Your pupper is super cute too, reminds me of black Lab! I love the look of the manor, that would be fun to explore as well. Flynn is adorable! My fur baby would absolutely love this, thanks so much for sharing! This stuff sounds like so much fun! I am sure my two fur-babies would love to go on some of these adventures.